An unaltered photocopy of your DD-214, or DD-215, DD-217, or Form 1577, or other military issued document clearly displaying your award of the Army Reserve Component Achievement Medal. Contact The War Library if you do not have a DD-214 or DD-215, DD-217, or Form 1577: 1-562-422-4100 (Pacific Time Zone). Don't forget to include an unaltered COPY of your DD-214, DD-215, DD-217, Or Form 1577 or other pre-arranged document(s). 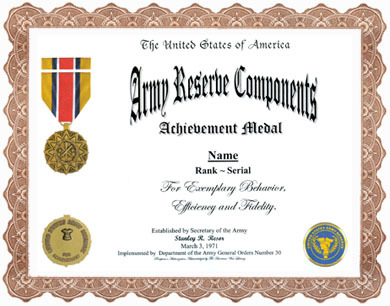 The Army Reserve Components Achievement Medal was established by Secretary of the Army Stanley R. Resor on March 3, 1971, and was implemented by Department of the Army General Orders Number 30 (1971). The Army Reserve Components Achievement Medal has been awarded for qualifying service from March 3, 1972 to the present. The Army Reserve Components Achievement Medal is awarded to personnel in the grade of colonel and below upon completion of three years service since March 3, 1971, with a Reserve Component unit for exemplary behavior, efficiency and fidelity. The Army Reserve Components Achievement Medal is worn after the Good Conduct Medal and before the American Defense Service Medal. Additional awards of the Army Reserve Components Achievement Medal are denoted by oak leaf clusters. The Army Reserve Components Achievement Medal was designed by Arnold P. Simmons of the Institute of Heraldry. The medal is a bronze medallion one and a quarter inches in diameter, consisting of a faceted twelve-pointed star with a narrow beveled edge the points of which surmount a wreath of laurel. In its center is disc within a smaller wreath of laurel which contains a torch between two swords saltirewise (points up) and flanked by two mullets. Between each point of the star (and in its re-entrant angles) is a bullet. The star refers to achievement and its twelve points refer to the measurement of time and to the sustained meritorious service of the Army Reserve Components. The disc (the circle of perfection) bears the torch for guidance and the laurel for honor and glory. The two swords crossed saltirewise represent both active and reserve forces and attest to eternal readiness. The two stars represent equality of effort. The reverse consists of a plain bronze surface within the encircling inscription UNITED STATES ARMY RESERVE (or, as the case may be, ARMY NATIONAL GUARD) at the top and FOR ACHIEVEMENT in the bottom. Beneath the upper inscription is a cuirass, and the space between the cuirass and the lower inscription is left blank for inscribing the recipient's name. The cuirass is taken from the Army Seal and alludes to the United States Army. The ribbon to the Army Reserve Components Achievement Medal consists of a field of gold with a central stripe of red bordered by white and blue. The red, white and blue are the National Colors. The red stands for hardiness and valor; the white for purity and valor; the blue for vigilance, perseverance and justice, and the yellow stands for high ideals. 1. Description: A bronze medal, 1 inches in diameter, consisting of a faceted twelve-pointed star with a beveled edge, the points surmounting a wreath of laurel and bearing on a disc within a smaller wreath of laurel, a torch between two swords crossed saltirewise, points up and flanked by two mullets. The reverse has the cuirass from the Department of the Army seal centered below "ARMY NATIONAL GUARD" or "UNITED STATES ARMY RESERVE" and above "FOR ACHIEVEMENT." 2. Ribbon: A 1 3/8 inches wide ribbon consisting of the following stripes: 5/16 inch Old Gold 67105; 1/8 inch Ultramarine Blue 67118; 1/16 inch White 67101; center 3/8 inch Scarlet 67111; 1/16 inch White; 1/8 inch Ultramarine Blue; and 5/16 inch Old Gold. 3. Criteria: The Army Reserve Components Achievement Medal is awarded for exemplary behavior, efficiency, and fidelity while serving as a member of an Army National Guard or Army Reserve Troop Program Unit for each four year period since 3 March 1972. Effective 28 March 1995, the period of qualifying service for the award was reduced from four years to three years; however, this change was not retroactive. Service must have been consecutive and service performed in the Reserve Component of the U.S. Air Force, Navy, Marine Corps, or Coast Guard may not be credited for award of this medal. The member must have exhibited honest and faithful service in accordance with the standards of conduct, courage and duty required by law and customs of the service of a member of the same grade as the individual to whom the standard is being applied. A member must be recommended for the award by his/her unit commander. a. Medal (regular size): MIL-DTL-3943/200. NSN 8455-00-464-2138 (National Guard) and 8455-00-464-2149 (Army Reserve) for set which includes full size medal and ribbon bar. b. Medal (miniature size): MIL-DTL-3943/200. Available commercially. c. Ribbon: MIL-DTL-11589/196. NSN 8455-00-464-2149.
d. Lapel Button (metal replica of ribbon): MIL-DTL-11484/101. Available commercially. 5. Background: a. The Commanding General, U.S. Continental Army Command, recommended adoption of a medal for the Reserve Components that would be comparable to the Good Conduct Medal for the Active Army on 11 August 1969. The Deputy Chief of Staff for Personnel, on 29 January 1970, requested The Institute of Heraldry (TIOH) provide proposed designs for consideration by the Secretary of the Army. 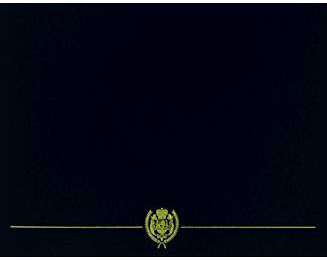 Designs were submitted in May 1970 and the Secretary of the Army approved the award on 3 March 1971.
b. The star symbolizes achievement and its twelve points refer to measurement of time and to the sustained meritorious service. The inner disc represents a circle of perfection and bears the torch for guidance and the laurel for honor and glory. The two swords, one for active and one for reserve, attest to eternal readiness and the two stars symbolize equality of effort. The red, white and blue of the ribbon, our National colors, stand for patriotism. The gold symbolizes merit. c. The Army Reserve Components Achievement Medal may be awarded to enlisted personnel and officers in the grade of Colonel or below. Subsequent awards are reflected by the attachment of an oak-leaf cluster to the ribbon.